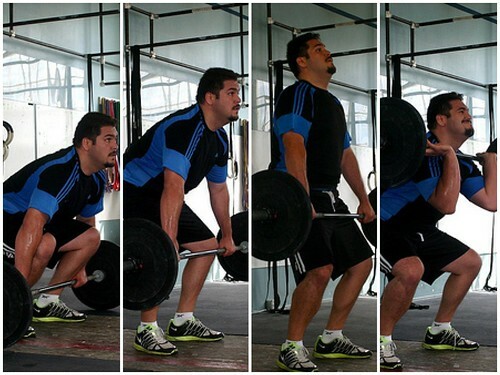 5×5 reps of 1 and 1/4 Front Squats, increase load each round, rest 2 minutes between sets. Notes: Focus on using the bounce out of the bottom! If you have a poor front rack position you may perform this with the High Bar Back Squat position. You may also sub regular front Squats. Notes: For those that get dizzy or nauseous during the forward rolls, you may substitute 5 candlesticks to standups. Tony drilling the mechanics for the clean! From left to right: position 3 at shins, position 2 just below the knees, position 1 at the hips, and receiving position in the front rack. Today I want to revisit the topic of transitioning to a more efficient forefoot style of running using drills from the Pose Method. Unless you grew up without shoes for the first 10 years of your life, chances are you do not run on the ball of your feet and instead have adopted an inefficient style of running characterized by a heel strike in front of your moving body. It’s not your fault; a lifetime of wearing cushioned shoes has ingrained into your subconscious the idea that it is ok to reach out in front and crash hard on your heel. After all, it doesn’t hurt one bit when wearing cushy Asics. This movement pattern has repeated itself millions of times over the past 20+ years of your life, and has therefore become embedded as a subconscious movement pattern. Just like driving or riding a bike, once you learn how to run you really don’t have to think about it anymore. You can talk on the phone, listen to music, or contemplate life’s problems. And there is no immediate reason to change your style or even think anything is wrong, because even though you are running inefficiently it is still pain free. This may go on for decades, but eventually the impact of the heel strike will catch up, and running may no longer be pain free, enjoyable, or even possible. That is the point where the majority of people ask me to help them transition to a more efficiently stride using the Pose Method. As in learning any new movement pattern, the gym’s motto of Mechanics, Consistency, Intensity still hold true. The most important criteria then for a successful transition is to focus exclusively on the Mechanics through technique work and drills. This also means completely removing all Intensity in the form of speed or distance. Once the technique is learned you still have to develop Consistency through constant repetition and practice. Removing subconscious movement patterns will not happen in a one hour session, but instead comes after weeks of conscious practice and repetition. This is where you develop new neurological pathways and muscle memory. In my experience, it takes an average of 3 months for the new style of running to replace the old and become automatic. Only once you have reached this point may you start to slowly add Intensity to your runs. If you add Intensity too soon or too quickly, you will automatically break down to your old movement pattern and undo all the drills and practice from before. The runners then with the best transitions are people willing to give up speed, either because they believe in the efficiency or they are recovering from old injuries. They have the least to lose and the most to gain by trying something new. The runners who make very little progress in adjusting their stride are young, fast, and run pain free. They have the most to lose (their speed and pride) and very little to gain in the short term by trying something new. No matter which group you fall into, it takes discipline and patience to switch your running stride. The good news is that once Intensity is added in appropriately, speed and distance come back in no time! Ask Caroline, JShap, Jess, or Zeb, to name just a few. Below is a video case study of a successful transition from a private client. After three months of diligent practice I believe we have established Mechanics and Consistency, and we can now start adding Intensity. She is a hardworking and dedicated student who put complete trust into the technique and never once deviated from drills. The video case study is great because of the drastic differences in the before and after footage. I think it’s obvious which is more efficient and which will lead to longevity in her running career. Enjoy! After three months of training (final). Notice how quiet and light she is landing, as well as how fast her foot is pulling. She is a completely different runner than before, it’s unbelievable.